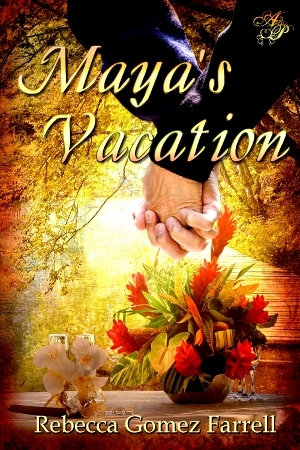 Maya’s Vacation is a sweet, contemporary romance novelette available in all e-book formats. It was published in March 2011. Twenty-year-old Maya knew, as she watched Dean walk away from her front door, distraught at her silence and her father’s threats, that she would never love anyone with the intensity that she loved him. He was her painter, her artist, her soul mate and being apart from him hurt too much. She tucked those feelings away, determined to enjoy the safe and secure life her parents approved of: business school and a marriage to Chuck, a successful real estate agent. Thirty years later, Chuck has cheated on and divorced her. But when he comes back, begging for reconciliation, Maya follows her intuition and takes a vacation to think it over. Her love of art, food, and wine combine at this retreat in the woods, and she prepares for a week of making new friends, tasting exquisite wines, and learning to paint again. What she hasn’t prepared for is the familiar voice she hears the first morning at camp . . . a voice that makes her skin tingle and brings back memories of who she used to be before Chuck. Has Maya buried her passion too deep to find love with Dean again? Maya’s Vacation is available direct from Clean Reads for $0.99. It’s also available at Amazon.